DAVID GORODETSKY first came to Arts Umbrella in 2016. In two short years, he became engrossed in the visual arts scholarship programs we offer. Now, David is enrolled at Emily Carr University of Art + Design (ECUAD) and is an Assistant Instructor at Arts Umbrella, among many other remarkable projects and commitments. Growing up in Coquitlam, David felt ready for a new challenge when he registered for Arts Umbrella’s Visual Art Summer Intensive (VASI) program. 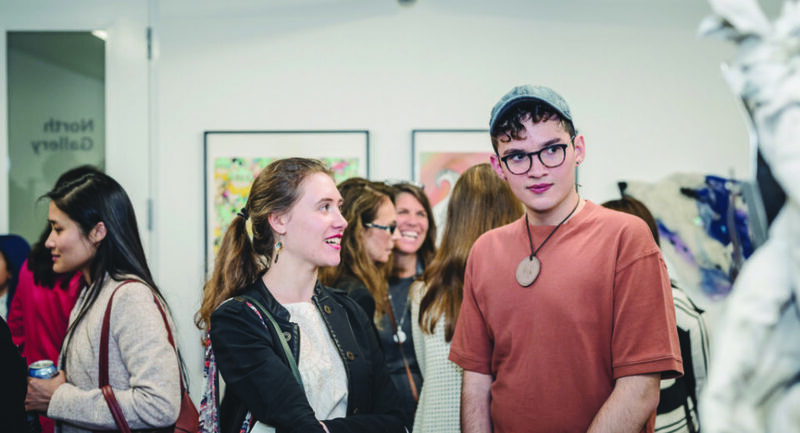 The full scholarship intensive is made possible by Lesley Stowe and Geoffrey Scott and offered in partnership with the Contemporary Art Gallery. “I was really excited to come to Granville Island and be immersed in a different community,” he says. In 2016, the program offered sessions at Simon Fraser University and the Contemporary Art Gallery, as well as artist studio visits and an exhibition opening. “From day one Arts Umbrella has had this innate ability to capture my interest and the interest of all my peers around me,” says David. Following the 2016 VASI program, David pursued many of Arts Umbrella’s visual arts scholarship programs: He has participated in the EA Teen Animation Scholarship, the South Surrey Teen Visual Arts Scholarship, and the Westminster Savings Teen Scholarship programs. He’s also the recipient of a Ken and Anne Woods Scholarship. Today, David is fully invested in the arts community. He regularly goes to shows and has joined several art collectives, including Flavourcel Animation Collective. He’s found community at Emily Carr as well, where he’s started a visual and musical collective with new friends. “It’s a really nice space to be in,” he says of ECUAD, “it offers a lot of opportunity.” We’re excited to see where that opportunity takes him.